The easiest search for Valencia Creekside Homes - just click "search" in the box above, save your search, and receive all new and updated Valencia Creekside listings emailed to you. Don't miss a listing! 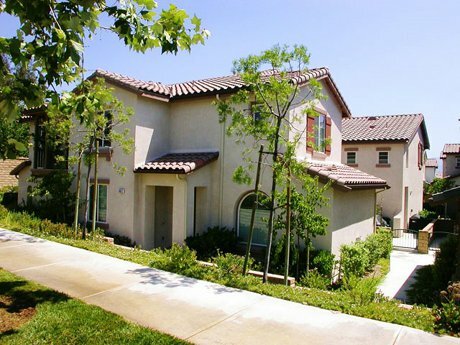 To view all Valencia listings or other specific Valencia or Santa Clarita Valley neighborhoods see the "easy listing search" links on the right side of this page. 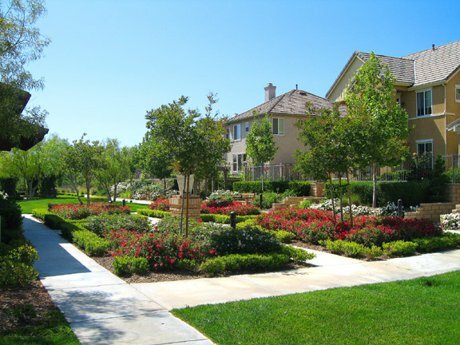 Valencia Creekside is a Valencia Village within the master planned community of Valencia...and all this is in the city of Santa Clarita! 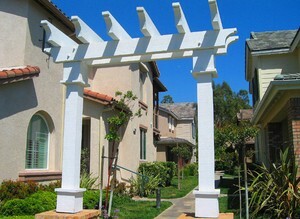 It was established in 2004, and became an instant hit with home buyers - homes sold quickly. I remember the crowds of people looking at the model homes and standing in line to purchase a home! You will like the number of styles of homes and townhomes - traditional style homes to homes with side yard and the garage in the rear. There are six distinct home tracts that range from townhomes to cluster homes, and traditional single family homes. The homes are arranged in a wonderful village atmosphere with beautiful green lawns with nearby benches to enjoy quiet time or visiting with neighbors. The Creekside neighborhood offers the homeowners many wonderful benefits included in the low Home Owners Association dues. There are lovely gardens as seen in the photo, vine-covered arbors, play areas, and the Creekside community swimming pool, spa, and clubhouse. And there are no Mello Roos fees. The nearby San Francisquito Creek Trail offers miles of walking trails and connect with other trails - such as the Bouquet Canyon Trail and the Santa Clara River Trail - and provide a great way to get out and exercise as well as visit your neighbors. This beautiful and quaint setting will make you want to smell the flowers! Valencia Creekside has a great location near the Valencia Heritage Park - with sports fields, the Bridgeport Shopping Center with lots of great restaurants to choose from, and a short distance to the Westfield Valencia Town Center Mall with more restaurants and great shops! 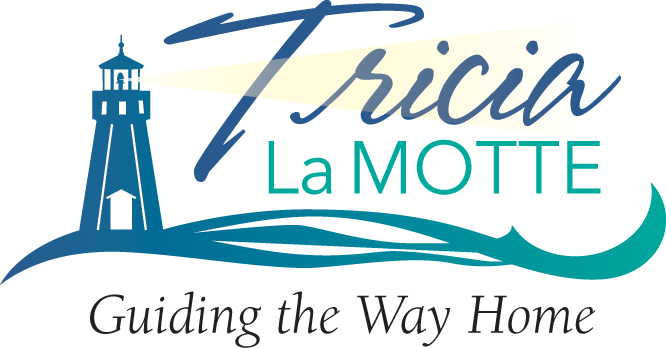 Nearby award winning schools are Charles Helmers Elementary School and Bridgeport Elementary School, Rio Norte Junior High School and Valencia High School. Brookside Walk - beautiful row style townhomes built by The Olson Company with 2 or 3 bedrooms have great floorplans ranging in size from 1080 to 1420 square feet, perfect for the first time homeowner or "move down" buyer that wants low maintenance since these do not have yards; they feature direct access to their 2 car garage; many have views of the Heritage Park and the nearby hills. Andorra - large 2 and 3 bedroom townhomes with small yards, built by William Lyons Homes, offer approximately 1288 to 1920 square feet with very usable floorplans with plenty of living space. Windsor Collection - built by KB Homes are unique detached 2 story homes with inviting landscaped walkways leading to covered porches that welcome you to open floorplans with 1500 to 2044 square feet of flexible living space. They feature spacious open living spaces and 2 to 4 bedrooms. The Windsor Collection offers open floor plans downstairs, and many models have a loft area which provides rooms for a computer workstation or home office setup. At the time these homes were built, they offered something new to Valencia neighborhoods - attached garages at the rear of the home! The Windsor Homes have smaller side yards for low maintenance and allow room for private outdoor living. Summer Grove, built by Richmond American Homes, these 3 bedroom cottage "cluster style" homes offer small backyards and popular floorplans from 1429 to 1749 square feet. The Willows - built by Warmingtom Homes are detached two story 3 and 4 bedroom homes with 1726 to 2245 square feet, have distinctive architectural styling with covered porches and some have second story covered balconies. Willows also have the unique look of the attached garages at the rear of the home. Somerset - these are the largest homes in Creekside; built by Warmington Homes, these two story 4 bedroom homes are 2139 to 2409 square feet and are the only traditional style single family homes in this lovely neighborhood. Many of these backyards are quite large and provide room for swimming pools and/or sports courts. These homes offer covered porches, island kitchens, rock fireplaces, and spacious rooms. 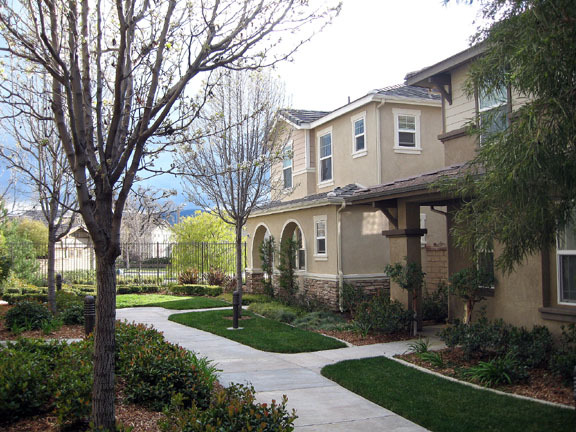 The Creekside Homes do not have Mello Roos, and with so many amenities, and the proximity to the Valencia Westfield Town Center Mall, and easy freeway access to Interstate 5, they are a great choice for homeowners of all ages.